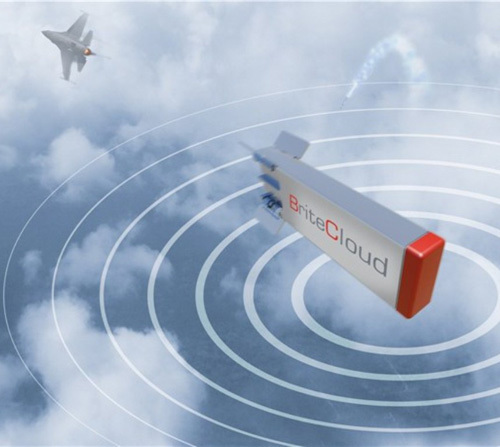 Leonardo has launched a new version of its BriteCloud decoy for fast jets, called BriteCloud 218, at the Electronic Warfare Europe event in London following trials with Danish F-16 fighter aircraft. The new 218 model, which adapts BriteCloud technology to fit into 2”x1”x8” dimensions, is designed to be compatible with aircraft that use this standard size of flare cartridge, such as the widely-operated F-16 and F-15. BriteCloud 218, which is now available alongside Leonardo’s BriteCloud 55mm variant, was unveiled at the Electronic Warfare Europe exhibition in London on the 6th June. BriteCloud is a compact radio-frequency device that is launched by a fast-jet pilot when facing attack from radar-guided missiles. Once launched, it creates powerful electronic emissions that create a ‘false target’ and draw enemy missiles away from the real aircraft. The decoy is dramatically more effective than traditional chaff countermeasures (radar-reflecting foil) and its on-board computer uses the latest electronic warfare frequency-spoofing techniques to protect pilots from even the most sophisticated modern missiles. Leonardo is the only company in the world to have successfully tested such a system on live trials. The launch of BriteCloud 218 follows a trial of the system with the Royal Danish Air Force (RDAF) on one of their F-16 aircraft. The BriteCloud 218 fitted directly into the F-16’s standard flare dispenser with no integration work required. During the mission, the RDAF F-16 dispensed BriteCloud 218 in response to being locked-onto by a real radar-guided surface to air missile targeting system. The trial allowed Leonardo to collect essential performance data needed to complete the adaptation of the proven BriteCloud hardware and software into the new, smaller, 218 format. Leonardo has already successfully tested the BriteCloud 55-model decoy (which is compatible with round 55mm flare dispensers) with the UK’s Royal Air Force (RAF) where trials with RAF Tornado aircraft proved the effectiveness of the product. The RAF has subsequently ordered further BriteCloud rounds to develop concepts of operations (CONOPS) for the product, which is the last stage of development prior to purchasing a system for operational use. BriteCloud 55 is also offered by defense and security company Saab as an electronic warfare option on all models of their Gripen fighter aircraft.